Growing plants from seeds isn't difficult; it just takes a little know-how. Now, gardeners of any experience level can get a jump on the growing season with this concise, straightforward guide. Expert gardener Barbara Ellis provides the basic information that you need and teaches you foolproof starting techniques for a variety of vegetables, herbs, and flowers. Starting Seeds walks you through everything you need to start in the endeavor of starting plants from seed in your front room, basement, greenhouse, cold frame, or kitchen window. A fantastic resource for starting plants from seeds. A step-by-step guide with simple but descriptive drawings, Starting Seeds should help the gardener from the moment the seed envelope is ripped open to setting out the young plants. Starting Seeds is a basic guide to growing plants from seed, whether they're started indoors or out. A great how-to resource for self-reliance. 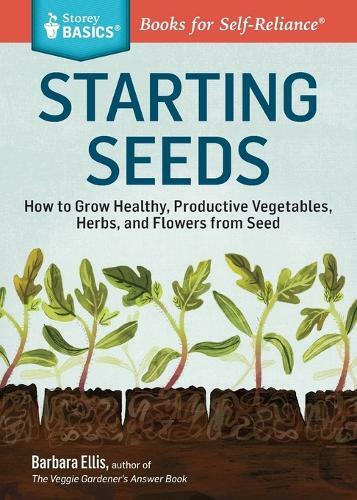 This book, part of the Storey Basics series, contains a treasure trove of information about starting plants from seeds in a book that is small enough to fit in a pocket.